after i squeezed myself into a van filled with strangers most of whom i've only met for the second time, i listened to sleepy chatter about the reality show "survivor". 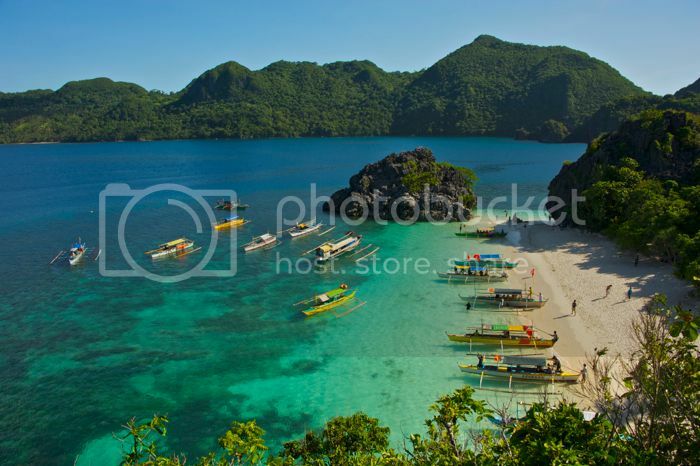 we were en route to the caramoan peninsula in camarines sur, whose savage countryside, limestone islands, untouched beaches, blue seas, and rugged charm were featured prominently in two seasons of the US version of the popular reality show. i contributed to the discussion by saying that the french and israeli editions of "survivor" were also staged in caramoan, many years ahead of the american franchise hosted by jeff probst. i followed "survivor: philippines" as it unraveled, and the show did such an amazing job at presenting caramoan, that it looked both unreal and unfamiliar. i had previously been to caramoan twice in the space of 4 years, first as part of a bicol expedition in 2005 that included 3 mountains, the bay of donsol, and the tempestuous seas on the eastern coast of camarines sur, and then again in 2009, during a vacation that could only be described as a stark departure from the backpacking trips i'm used to. in those two visits, i witnessed a startling transformation, intimately linked to the sudden rise of caramoan's fame following multiple exposures on various editions of the wildly popular reality show. many of my last few entries contemplate the clash between tourism development and conservation, and i've rued the latter's unfortunate defeat in most cases. i wondered whether caramon had suffered the same fate, even as we began the journey that would outlast us all. 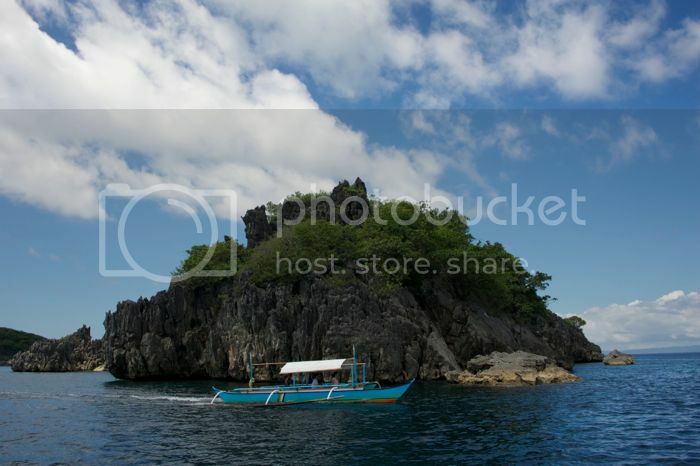 contrary to what some might think caramoan is actually not an island. it is not even a group of islands. 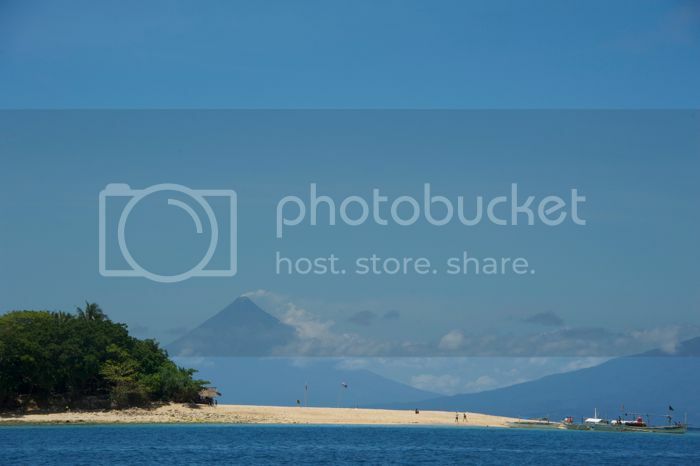 it is a town on the eastern coast of camarines sur, at the tip of a peninsula pointing towards the island province of catanduanes. what suggests that it is an archipelago separated from the mainland is the preferred mode of access: by boat. the roads that connect the center of caramoan to naga are unfortunately in various stages of disrepair that visitors instead head towards sabang port in san jose to catch a long and sometimes turbulent boat ride. 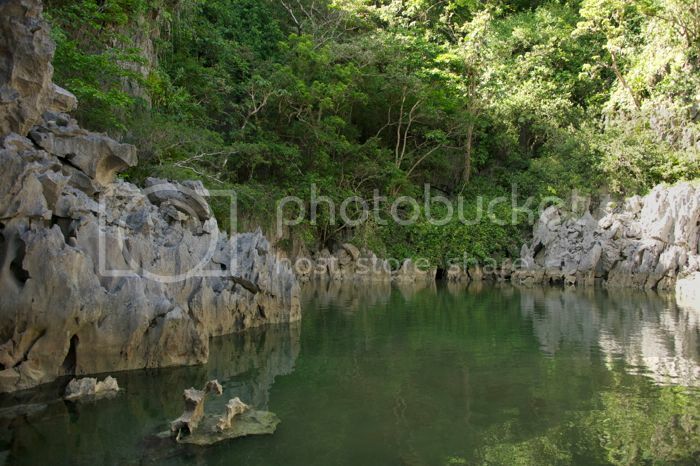 sabang port itself is located on the banks of a shallow river that flushes out onto lagonoy gulf. at one point the boatmen had to ask the male passengers to get down to help push the boat and i unwillingly obliged. after departing sabang port, the boat steers east towards catanduanes, cruising close to the coast of presentacion town, which forms part of the peninsula. the views here are incomparable. to the west is the imposing sight of isarog, and on the south are the peaks of malinao and mayon. 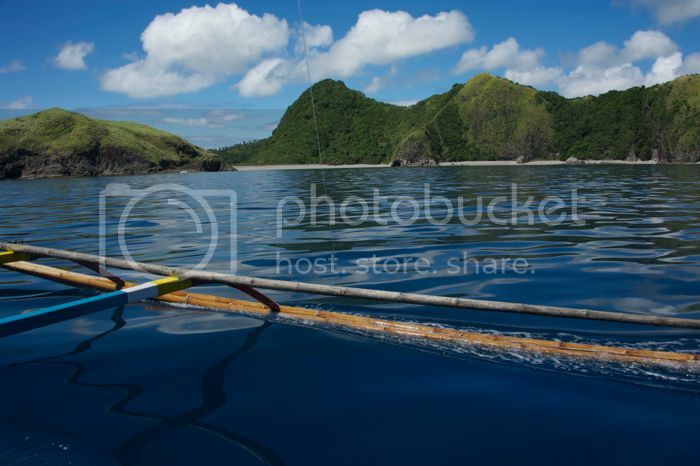 eventually, the boat reaches the edge of the caramoan peninsula, and continues to hug the shore, turning northwest towards gota beach. the distance that's traveled is over 60 kilometers, and when the waters on the maqueda channel don't cooperate, the boat ride could take over 3 hours. islands begin to appear on the vast open sea, some of them a bouquet of trees surrounded by cream-colored sand, others just outcroppings of jagged limestone, resembling the skin of a prehistoric reptile. during my last visit to caramoan, we stayed at the well-appointed gota beach resort. the ride was not as interminably long as this one. we took a fast craft to guijalo port and transferred to a vehicle that took us to the northern coast of caramoan town with its pre-fabricated huts. this time around we decided to take the longer, more scenic route, along the peninsula's long coastline with its green hills and rocky shores. the first island on our itinerary is lahos, which consists of two domes of limestone connected by a sandbar. i remember exactly how it looked like 9 years ago and pretty much looks the same except there are more people now, and an equivalent number of boats moored off shore. i wonder if these tourists took the long route as we did, because i did not find many boats depart sabang. the boulders resemble armors filled with sharp spikes. in some of its crevices, human trash had been left behind. i am immediately uninterested and i regret being in a place overrun by people. but perhaps it could be worse, i thought. we didn't stay there long enough for me to complain about the crowd. we then moved to matukad island. in 2005, this is where we set up camp. ours was the only boat anchored on the beach, although post-"survivor", caramoan's fame had reached miles beyond its badly-maintained roads, attracting a fair number of tourists eager to outwit, outplay, and outlast others who have not been there. i looked around and came to the quick though reasoned conclusion that caramoan's rugged charm attracts all kinds of people. we truly are running out of wild places, and adventure has been misappropriated by the instagram crowd. our guide then mentions the hidden lagoon. matukad is by no means a large island. after the beach, it rises steeply into a forested limestone perch. i could not imagine that there could be anything else there apart from the pocket of beach. but on the northeastern end of the beach is a wall with a well-worn climbing path. appearances are apparently deceiving, since it isn't particularly difficult to get to the lagoon. it takes only a bit of courage and a dash of determination to pull yourself up the wall and down to the small pond surrounded by steep walls of jagged rock. the lagoon is a shallow body of water whose origins and inhabitants have invaded legend. one of my companions shrieked shark! the locals say it is milkfish. it is a sleek-looking fish with a prominent dorsal fin. i've seen something like it in an aquarium. and it is not alone. there are other smaller fish there, swimming quietly among jellyfish. visitors are advised not to wade into the lagoon, so as not to disturb the spirits that live there. the bangus is also not to be caught. there used to be two in the lagoon, and a hungry fisherman caught the other, ate it, and died. at least, that's the story that's passed around. we spent the night on matukad, watched as a pale sunset replaced the sky, as boats departed our beach, and as stars appeared overhead. 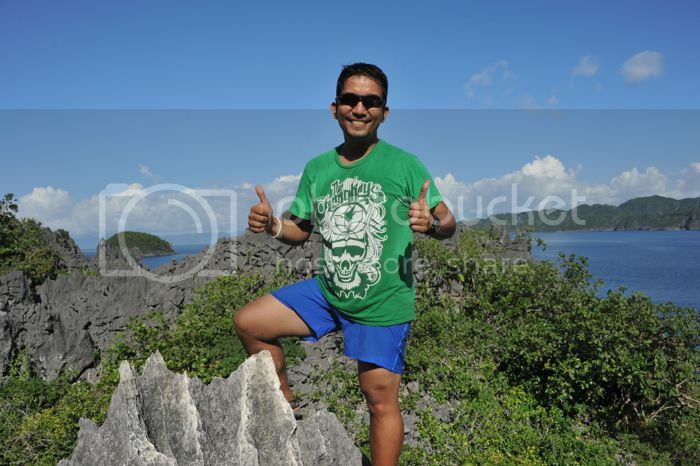 the following day, we left matukad island to return to sabang port, but not after a stopover at bgy. baliguian in presentacion to see the ba'haw waterfalls. from the pebble beach, it is a brief walk to the man-made pools that offer visitors a quick and refreshing escape from the heat. ba'haw is an example of a staircase waterfalls: it consists of several cascades, where water plunges into pools of varying depths and sizes. 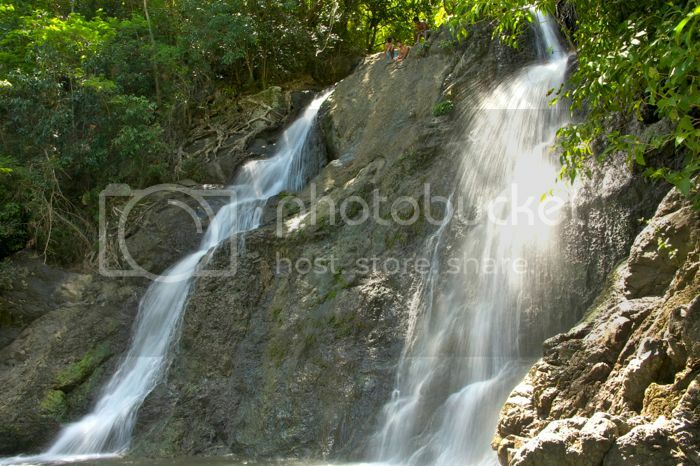 it is being developed and maintained by the local barangay as a tourist attraction. i walked alongside the barangay chairman as he proudly declared his plans for the future. from baliguian, it is another hour to the port of sabang in san jose, which we reached late in the afternoon. naga was still an hour away, and manila, another 10 hours. portions of the national highway in quezon were closed off for repair and rehabilitation. we were dropped off in makati at past 7AM on monday, and i would later learn that i was the only one who managed to report to work that same morning, although i doubt if i was any more productive than my companions. i spent more time inside a rented van and onboard a crappy boat than in caramoan itself, and that was the closest i got to being a survivor.